I've been using the McDonald's App for about a year now. It is pretty slick and gives you some good discounts and acts as a punch card for items like coffee that give you a free drink. I usually open it on my way there to see what deals and coupons they have. This week I opened it and saw a coupon for $3 off $10. Apparently, that deal was only good if you ordered ahead of time. So when I got to the window the lady said I needed to order ahead of time. I asked if I could order in the app since I was already in line. She said I would need to drive out and get back in line. Hey, I get it, the idea of this deal is to get people to put in their payment info and use the app. What I recommend to McDonald's, however, is to let people like me who are regular customers and learning the new rules they are imposing to use the discount this time, and advise me to order ahead next time. Giving the cashier the ability to give me the discount would have made her job easier and me happier. I did drive around again because I am a marketing geek and wanted to see how this whole thing would play out. I also knew I was going to write a blog post when I got home. Is McDonald's going to read this and change their policy, probably not. I am writing this for you. When putting promotions into action, make sure you allow for some wiggle room and make sure your employees can make good decisions at the moment to help the customer. The name of the game these days is customer experience, also known as CX. Those businesses that are good at it will have a huge advantage over their competition. Created a contest for attendees of the Social Media Club networking event. 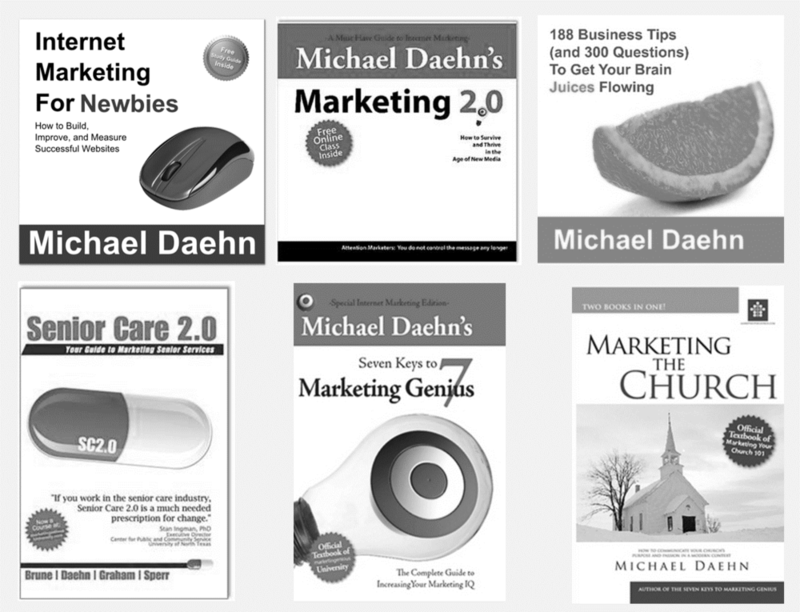 Anyone who scanned the QR code Michael Daehn was wearing with their phone would be entered in to win an autographed book, and a marketing brainstorming session with Michael. When scanned participants would be able to send out a tweet on Twitter that was automatically created by the QR code. Around 20 people scanned/tweeted and Michael was able to meet dozens of new people in a 2 hour session. QR Codes are 3 dimensional scannable images that hold more information than traditional barcodes. QR stands for quick response since you can scan a code and quickly pull up additional information about the item labeled with a code. QR Codes can be read with barcode scanner applications that are available on most smartphones. Google Goggles, Barcode Scanner and Redlaser are some of the most popular. The real value of a QR Code is that it allows the user to get additional information about the labeled item without having to type anything into their mobile device. It's very simple to make a QR code. Go to a website that creates QR Codes and enter the information you want to have translated into a code. There are many free sites that offer this service. I use Kaywa.com to make my codes. If you watch the video above you will see that you can easily create a fee QR Code in less than 60 seconds. Now the fun begins. Put QR codes on any of your point of purchase and/or promotional materials including posters, table toppers, receipts and coasters. You can put your QR Code anywhere you can print it, so be creative. QR Codes have been popular in Japan for some time, but they are just now hitting the mainstream in the US. Since I have been working on a mobile application that uses QR Codes I have been keeping track of the growth of QR Codes and mobile marketing and bookmarked over 30 articles about their use in the past 6 months. They are showing up everywhere from the local Starbucks to Times Square. QR Codes can be read even if some information is missing. You can take advanatage of this by putting a small logo or image into the QR Code. It's not an exact science, so do some experiementing and make sure your code is readable before you publish. 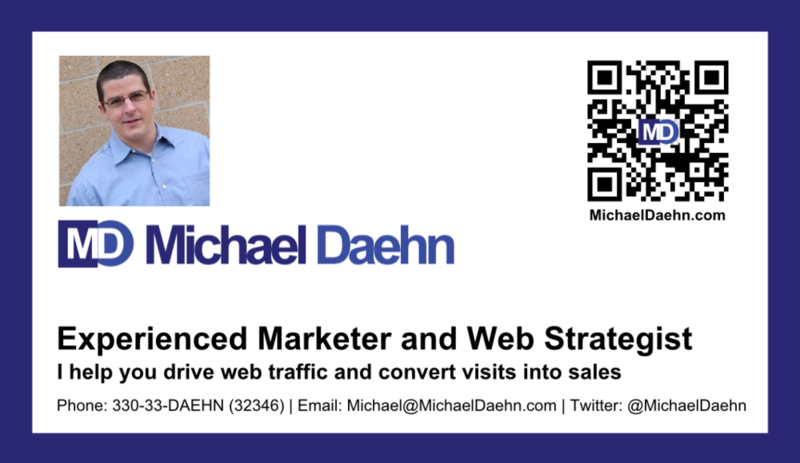 Put a QR Code that links to your website, contact info or Twitter feed on your name tag. Not only is it practical, but it's a real conversation starter. 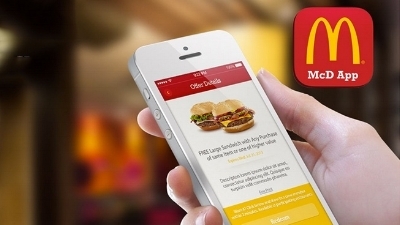 Have you used QR Codes in your marketing? What other ways do you think they can be used? Do you think this is a fad or will it be around for a while? This project involved creating a moblie application for entry into the Maritz Mprize competition. I created the initial concept for the project as well as developed the video, Google video ads, logo, colors, marketing plan, social media sites (Twitter and Facebook), QR Codes, and presentation to judges. On Monday my team presented our mobile application, MPulse, to the judges of the MPrize competition at the Maritz headquarters in Fenton, MO. I have to say I thought our product looked good and we looked snazzy wearing our matching QR coded shirts. Unfortunately the judges went with one of our competitors. I am more than a little disappointed. I have been working with the 5 members of my team on this project for the past 6 months. Thanks to the hard work of my teamates we put together an application that could be used right away in the marketplace. The judges did mention that they liked our product and wanted to incorporate some of our features into the winning product. Overall it was a good experience and it was fun to see an idea turned into an actual working product. I want to thank my team Silvana, Jon, Eric, Don and Rob for all the hard work they put into MPulse. We learned a ton and I'm sure the knowledge we gained from putting this together will pay off. Take a look at the overview video and a couple of Google commercials I put together for the presentation. 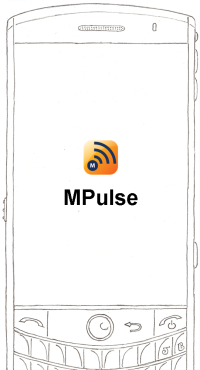 Would you use Mpulse or a product like it as a customer? For your business? Check out this great article from Mashable on how to use QR Codes for marketing. I am working with a team this summer to create a mobile app for Maritz and using QR Codes is a key feature. With the move to mobile, these handy little bar codes will be everywhere in the next few years (until they come up with something better). What do you think of QR Codes? Have you ever used them for marketing? If you read my blog posts you realize I'm intrigued by the various location aware applications that are coming out. Whether you have jumped on the bandwagon not, there is a lot to be learned about consumer behavior by following what is happening with these formats. A recent study by uTest has found that people are more concerned with ease of use (some would call this user experience) than the badges and rewards they can earn. Seems like convenience is one of the greatest incentives you can offer your users. So even if you are a brick and mortar location it is important to realize that convenience can be the most important thing you offer. I know I would rather shop at Ace Hardware than Home Depot, and I prefer Target over Wal-Mart. I'm willing to pay a little more for helpful staff and clutter free aisles that let me get in, make my purchase and get out hassle free. Read the full report on uTest or a summary of the results on Mashable. How can you make your product, service or website easier to use? Should You Build a Mobile Website or App? I've been working with a team to build a mobile app for Maritz in the MPrize competition. One of the first debates was whether to build a mobile app, or a mobile website. I argued that a mobile website would be easier to implement and be available over multiple platforms all at once. Mobile apps are great, but they take a lot more effort to put together. Then you have to get people to install them, and keep them updated. The team decided to go with the mobile website instead of an app. The article goes over in more detail the many reasons why they chose this path. What do you think is the best approach? Play SCVNGR at your favorite cafe, gym, park, theatre, or restaurant. You deserve 'em! Do challenges, earn points, unlock badges and features. Good news, my team was chosen from dozens of entrants to move to the next phase of development in the MPrize competition. Maritz created an open competition for teams to submit ideas for a mobile app to be used for their company. My team developed a mobile tool using QR codes that I think would work very well for Maritz. The team will have the summer to develop the app and a winner will be chosen in August. Wish us luck!